You all may be aware that Microsoft released the new Windows 10 Technical Preview. But what you might not know is that Microsoft also released the Windows Server Technical Preview. There is no official version/naming that I am aware of, but for reference the build version is 6.4.9841.0. In addition to the similar changes previewed in the Windows 10 Technical Preview (i.e. multiple desktops, the start menu, etc. ), there are some server-specific changes we can observe. For reference, here is a screenshot of the Windows Server Technical Preview start menu. The following is the list of server roles and features that I have observed as being new (in comparison to Windows Server 2012 R2). So, what exactly are these new roles and features? MultiPoint Services: MultiPoint Services allows multiple users, each with their own independent and familiar Windows experience, to simultaneously share one computer. Network Controller: The Network Controller provides the point of automation needed for continual configuration, monitoring and diagnostics of virtual networks, physical networks, network services, network topology, address management, etc. within a datacenter stamp. Canary Network Diagnostics: Canary network diagnostics enables validation of the physical network. MultiPoint Connector: MultiPoint Connector enables your machine to be monitored and managed by the MultiPoint Manager and Dashboard apps. Remote Server Administration Tools > Role Administration Tools > Network Controller Management Tools: Network Controller Management Tools includes Powershell tools for managing the Network Controller Role. Soft Restart: SoftRestart enables the system to be restarted without undergoing firmware reset delays. Windows Defender: Windows Defender helps you protect your machine from malware. Windows Defender > GUI for Windows Defender: GUI for Windows Defender. Windows PowerShell > Windows PowerShell 5.0: Windows PowerShell enables you to automate local and remote Windows administration. This task-based command-line shell and scripting language is built on the Microsoft .NET Framework. It includes hundreds of built-in commands and lets you write and distribute your own commands and scripts. Windows Volume Replication: Allows you to replicate data using the Windows Volume Replication (WVR) feature. Now by comparison, the following are server roles and features that I have observed as no longer being listed/available. I devised this list by listing what roles and features were available in each. 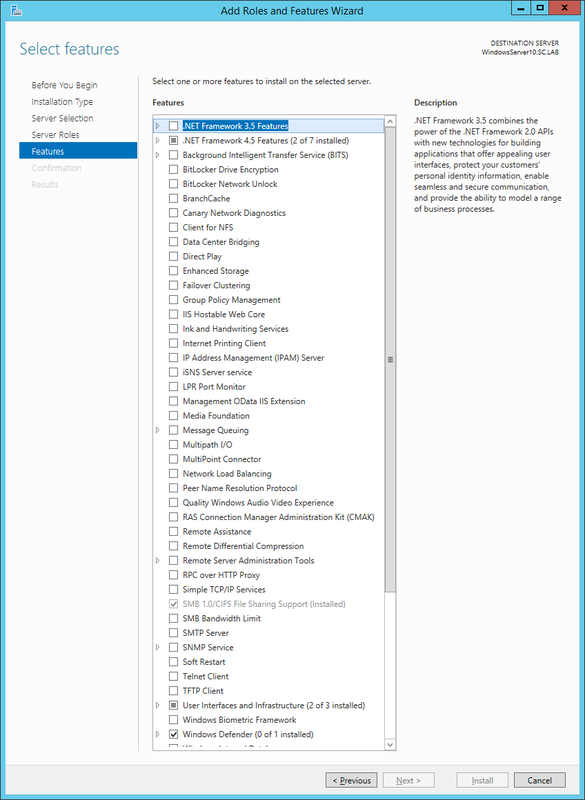 The result is a list of roles and features that were available in Windows Server 2012 R2, but are no longer available in this version of the Windows Server Technical Preview. So those are some of the interesting changes thus far with the new Windows Server Technical Preview.